Bike Lane crossing over Expo tracks at Gramercy Place. The first phase of the Expo Line officially opens Saturday, April 28, and the 5.9 miles of Expo bike lanes running parallel to the project are a welcome addition to the Los Angeles County bikeway network. Metro hopes the new rail line proves to be a success with riders of all types. The Expo Line’s parallel bike lanes should also help foster multi-modal bike commuting and create easy east-west cycling connections. Ample bicycle parking at stations also will be available. Several local bicycle blogs have raised concerns about safety along the route, particularly where the lane crosses the railroad tracks at Exposition and Gramercy, approximately one mile west of USC. We’re happy to report that the city of Los Angeles’ transportation department — known as LADOT — recently added new roadway markings and signage to improve this crossing, including a limit line and a bicycle symbol. Riders are still encouraged to proceed with caution, because, as cyclists well know, train tracks can be tricky and cyclists need to avoid getting their wheels stuck or turned sidewise in the tracks’ wheel wells. Always ride across tracks as close to a 90 degree angle as possible, and cyclists should take extra caution if it’s raining, slick or if their tires are of the extremely skinny variety. Cyclists should always obey all traffic signs and signals, including roadway lane markings. Ride predictably, and always in the same direction as traffic. And of course, never ever cross tracks when crossing lights and arms are activated. “When approaching this intersection eastbound, be sure to watch for trains and adhere to all traffic and warning signals. If the light is red, be sure to stop behind the limit line (this will position you on-top of a loop detector, which alerts the traffic signal that a bicycle is present). 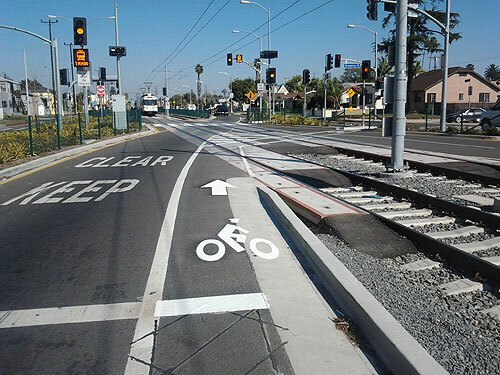 When the train clears and the light turns green, follow the bike lane to cross the Expo Line tracks, which will continue along Exposition Blvd. heading east.” (Westbound riders will not encounter this particular issue, as the path does not cross the tracks). You can also watch a video of the LADOT team riding the path in its entirety. Thanks for highlighting this issue, but you do realize that it is physically impossible to follow the given advice, right? Eastbound, the marked apex of the bike lane is past the first track. Westbound, there is no line one can take over 60 degrees, let alone close to 90. It is not possible to achieve a safe crossing angle within the lane markings. Eastbound, getting close to 90 degrees would require leaving the bike lane in advance of the intersection to prepare for the turn. Westbound, assuming that cooperative drivers were to give you use of the entire lane (yeah, right), you would still need to swerve to the rightmost side of the lane, then cut across to the left side of the lane. So much for riding predictably. I know, I know, it’s crazy to think that a bicyclist might want to continue west on Rodeo, because we all know that bicyclists don’t ever ride outside of bike lanes. These two instructions are incompatible with one another. The eastbound bike lane hits the tracks at a very shallow angle; by following it, you’re crossing the tracks in precisely the manner that makes it *more* likely the tracks will grab your wheel, and also putting your tires in greater contact with the slippery metal rails. The sharp turn directly over the tracks means you’re applying additional pressure to your front wheel right when it’s in contact with the rail, increasing your chances of losing traction and taking a spill. My personal recommendation for getting across: before reaching this crossing, position yourself in the main travel lane, well to the left of the tracks. As you start out through the crossing, make a clear right signal so drivers behind you know what you’re doing. Scan over your right shoulder to make sure nobody’s trying to pass you on the right. When you’re almost even with the little curb cut and crosswalk on the other side of the tracks, make your sharp right turn over the asphalt, so that you’re already pointing in the direction of the bike curb cut before you hit the tracks. This means you cross at close to a 90-degree angle, without changing direction on top of the tracks, and keep your wheels in contact with the rails as little as possible. I think a little restriping may need to be done here. Both this photo and Google Maps show a pretty shallow crossing angle. Maybe a more zig-zag lane would allow crossings at closer to 90 degrees? Awkward looking, but perhaps safer. I read that in some European cities there is a certain kind of foam that fills the tracks where bikes cross and that it only depresses down when the train wheels are on it, preventing bike tires from getting caught in the tracks. But I agree that the bike lane setup here is very poorly implemented. As a matter of fact, this whole set-up in general at this intersection baffles me as to why this design was acceptable. The close interfacing between trains, pedestrians, bikes, and cars, with no crossing gates for the train and the whole “X” shape of the crossing streets seems quite dangerous and less efficient for the train (as I believe there is STILL no signal preemption even at this lightly used intersection). Why this part is still classified as “street-running” therefore having no crossing gates is beyond me. This type of intersection crossing seems much more akin to a streetcar than a rapid LRT line which we have supposedly tried to implement. Where are the crossing gates?? is an accident waiting to happen. Was Metro trying to safe on a few bucks by not implementing crossing gates? So long as Metro makes no money and is reliant on our taxes, this is the best we get. Crossing gates are definitely needed, and re-striping the road to make it more bike friendly would be a good idea. I’ve never heard of that bike foam that someone else mentioned, but maybe metro can look into that? I think it might be a good idea to invest a bit of money now in making this intersection safe as opposed to paying out a lawsuit later when someone gets hit. At least there’s a stop line as a hint that you could ride right into an oncoming train. How about a sign? In Portland, Oregon they put cement with ridges in it (Portland Cement??) as close as possable to the tracks for the greatest traction in wet conditions. And there is some sort of plastic foam to fill in the gap next to the tracks and prevent catching a narrow wheel.